Today, I decided to participate in the Hollywood Housewife's #onedayHH challenge to document all of the mundane moments in my life on Instagram. I got to picture number 3 of the day and was hit with an itch to get some things out. So here we are. That was my 3rd photo of the day. I bet some of you are thinking what I'm thinking. 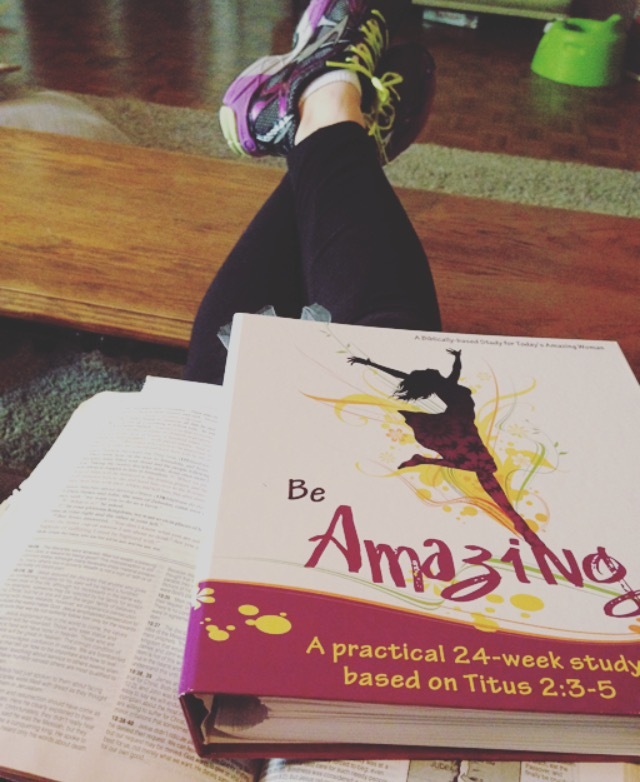 That "Be Amazing" is a silly name for a women's bible study. That the cover design is so cheesy. That if someone or something else tells me how to be a woman, I might lose my cool. The first week of our bible study, I made all of these observations. And immediately, in those first minutes of being there, the Lord began speaking to my heart about each of them. About how the title and the cover design don't really matter. And about how the "someone" who's behind all of this and who's telling me how to be a woman is actually God. A sweet friend addressed this very thing in our first meeting. She talked about how sometimes with "church stuff," we get this icky feeling that rises up and provokes us to become defensive, offended, or turned off. And when that happens, it's important that we examine things further. What we do with those kinds of feelings is very important. If we take them in and give them a home in our hearts, we can end up as pretty bitter people. When feelings like these aren't dealt with, you end up with people who leave the church for trivial reasons or write blog posts about how contemporary music in the church is all wrong or believe that all worship leaders now are just a bunch of performers. All of this because someone felt off, uncomfortable, or didn't have enough information. All of this because of an icky feeling. Usually, icky feelings like these are not indicators of wrongdoing around us. They're more than likely indicators of wrongdoing inside of us. In a matter of minutes during that first gathering at our church, my heart was softened. Instead of grabbing hold of my petty commentary and sticking by it, I found myself letting go of it and asking the Lord to continue opening my mind and heart to what I needed to hear that day. We're several weeks into this study now and it is one of my favorite things I do all week. It's no surprise that I love the women in my group, my leaders, the yummy breakfast, and the free childcare. I expected all of those. But beyond that, I am loving the challenge of doing a bible study that forces me to read more scripture and ask more questions than are on the page. I'm more than happy to be doing a bible study that isn't entitled something ridiculously creative, begging to be hashtagged. It's not trending on social media and it's not the next big thing. (Now, there's nothing wrong with bible studies that are popular and that have more current designs and titles. I've done plenty of those and they are great. My point is that it's not the point.) I'm truly glad to be doing a bible study written by women who love the color purple and who chose the picture of a girl leaping for the front cover. That means these women are different than me. Not wrong, not cheesy, not silly, not dumb. Different. I can always learn from different. Maybe it's not a bible study, but it's something else for you. That icky feeling rises up in all of us. Maybe someone at your church "just bugs you," so you avoid them. Maybe you get riled up at the sound of loud music played by young people in your church, so you criticize them and their intentions. Maybe you've been hurt by a lot of church people, so you decided to give up on church as a whole. I'm not saying all of those situations aren't hard, but I am saying that we should push deeper until we find our real problem. Our real problem is usually us. Our selfishness and pride get in the way of a lot of things. It's just easier to put blame elsewhere. When someone or something rubs us the wrong way, let's be big enough to question ourselves and ask the Lord to reveal the places in our own hearts that aren't right. What's my heart attitude? What's at the bottom of this? Where could I be wrong?